Motorsport is not just about the spectacle of some of the world's most popular and famous sporting events - it also plays a crucial role in developing new techniques and technologies. Each unit in the IMI and EAL level 2 courses are covered in full, and the chapters can be easily matched to the BTEC First course structure. 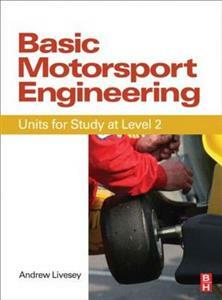 The book covers introductory topics in motorsport from vehicle science and maths through the basics of vehicle maintenance to pre and post race inspections. Written by an experienced teacher and author with decades of involvement with the industry, packed with detailed colour illustrations and learning tips, "Basic Motorsport Engineering" is the perfect textbook for you to make the first move into this most dynamic of industries. It is fully matched to IMI, EAL and BTEC course structures. Each section is fully illustrated with photos, diagrams and key learning points. It is written by an experienced author and teacher.